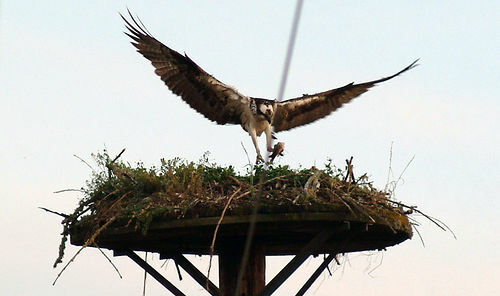 A nesting osprey (photo by Flickr user Yai&JR). There are two kinds of people in the world, as the saying goes, those who divide the world up into two kinds of people and everyone else. One way to draw the line: those, when presented with a new idea, a challenging opportunity, or a risky possibility, who come up with reasons to say no, and those who come up with ways to make it happen. A couple of decades ago, while sharing office space with an environmental law firm, I posed a question to one of the attorneys: could I use the Migratory Bird Treaty Act to prevent a local government from placing a trail near an osprey nest. The answer, in a word, was no, accompanied by a host of reasons. The law wasn’t designed to prevent that sort of activity. It was hard to enforce. No one had done anything like this before. You know how this kind of conversation goes. They may be highly skilled at their work, friendly, and supremely earnest. But when presented with the new and different, they tap their creativity and cleverness to present barriers – all of the reasons why it’s a bad idea, why it won’t work, why it will cost too much – rather than ferret out how to pull it off. Government (sadly) tends to cultivate and reward this approach. Large organizations of all types are notorious for doing the same thing. Even small organizations can inadvertently find themselves elevating inertia over taking risks and tackling the hard problems. Not liking the answer to my bird protection question, like a kid who tries the other parent when the first answer is no, I tried again with another attorney. The answer: it’ll be really tough, but sure, it might be possible. You’d have to find strong science showing trail impacts to the birds. You’d probably need documents showing that the local government knew there might be impacts. You’d probably even need to show actual dead birds to more clearly establish the link. No sugarcoating and no false sense of optimism, to be sure, but a profoundly different attitude to the challenge: it won’t be easy, but here’s what it would take. Inertia and the art of ‘no’ cohabitate, and it can take some real effort to hold it at bay, but if your organization wants to uncover better solutions to the problems you are hoping to solve, if it wants to delight its customers and frustrate its adversaries, and if it wants to generate extraordinary results, it’s worth encourage your colleagues to adopt the “here’s a puzzle to solve” attitude instead of the “here’s a bunch of reasons why it’s a bad idea” approach.